You know those weeks when everything starts out rosy? And then ends up like the front end of the Titanic? Those weeks? Welcome to my world; welcome to this week’s News, Views and Truths. So, let’s start by casting our minds back to Monday. What a wonderful start to the week; the sun was shining, the birds were singing and the global market rallied in unison on the belief that the US and Chinese authorities were in agreement as to a potential cessation in their trade war. The Chinese government expressed confidence that an agreement with the US could be reached, following a meeting between President Donald Trump and President Xi Jinping at the G20 summit in Argentina. As a result, the FTSE 100 rose to 7,125 points, with steel company Evraz up 7.9% and oil field service firm Wood Group up 6.1%. Mr Trump opened his mouth. Now, as many of you know, I am not a rabid and vehement hater of the ‘Orange Man’. However, sometimes he does excel himself; this is one of those times. Mr Trump, thinking it was a good idea, posted this on Twitter. 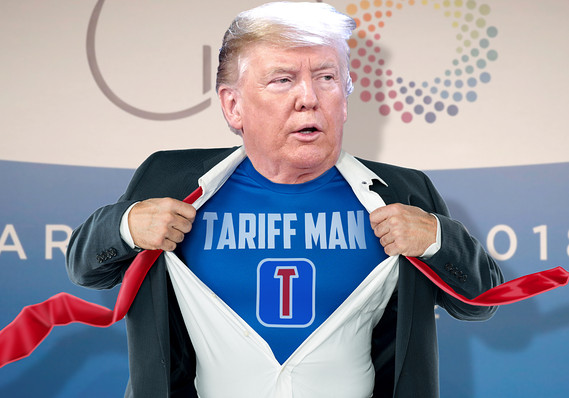 Tariff Man. Tariff Man destroys economic relations faster than anyone can. Uncertainty began to grow as to whether or not there was any understanding as to the details of an actual agreement between the US and China. Senior White House officials attempted to smooth over the issue, with Economic Adviser Larry Kudlow saying that negotiations were “pretty far advanced”. However, he then went on to state that a deal “may not get done” and “I have no assurances”. Pfft; go big or go home. On Wednesday night, it was announced that the Chief Financial Officer of Huawei Technologies Co, this Chinese mobile phone manufacturer, was arrested in Canada over potential violations of US sanctions on Iran. Guess what this did to the US-China trade relations? Never mind what China thought about this action, the market gave up all hopes of a resolution in relations on Thursday and sold off. European markets in particular were hard hit; the German DAX entered bear territory with a near 20% fall from its previous highs. The Euro Stoxx 600 traded at its lowest level since December 2016. And yet, despite another very negative day in the US, the tech-heavy Nasdaq index ended the session up 0.40%. That is because sentiment is starting to sense that the reaction was overdone; analysts at Oxford Economics said that markets had become “overly gloomy”. It is right to say that market participants are fragile. It is very easy to become spooked on initial reactions to news flow. And what does today look like? The FTSE 100, as I write, is up 1.33% on the day. Developed markets across the globe are showing significant daily returns although US futures point to a slightly lower open. So what does the future hold? I’d suggest less Santa Claus and more Santa Pause. In all seriousness, this is simply the continued return of volatility after years of benign markets. However, as demonstrated this week, the best daily returns follow the worst and you are simply unable to negate these. Fact is, markets are cheaper now than they were last week. Again, be greedy when others are fearful; Mr Buffet absolutely will be. And in usual fashion, a playlist to end the week. Have a great weekend and I hope to see you all next week.